Much of the cover art for ‘The Walking Dead’ is less of a direct representation of what is going inside the book itself, rather than the cover art tending to be more representative of the general themes you will find in the 22 pages of story in that issue. This can sometimes be slightly frustrating if you are expecting the cover art to act as some kind of a trailer to the main content. An Example? See issue 54, and read the review here, but without wanting to spoil too much (and if you are reading a review for #59, surely you have read #54???) but the ‘all-out action!’ does not involve Sgt Abraham Ford with a guns-blazing stance, straight out of those those John Woo films, dealing furious death on a teeming horde of revenants….So you have to take the cover art with a pinch of salt – great art, but not necessarily telling the truth. Not so with issue 59! This cover is telling you exactly what is going on in the book. Literally. 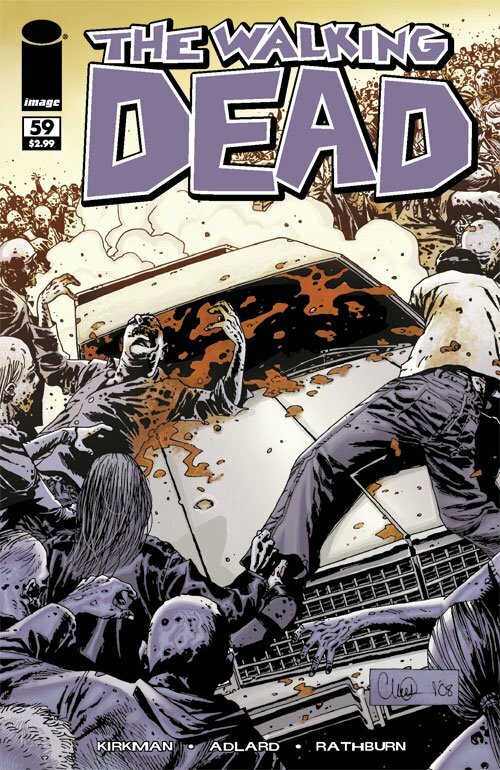 The excitement and danger of the cover is replicated inside, as Rick, Carl, Abraham and Morgan make the intended stop off for supplies at Rick’s former Police Station, but beyond that they then get into a whole lot of trouble very quickly as they encounter a herd. Abraham described a herd a few issues back, but seeing this mass of undead is truly unnerving. Lucky for them they just stocked up on ammo and guns. The issue is light on dialogue compared to recent issues, but my gosh it delivers on thrills. We leave the quartet in a truly perilous situation, but with the highly capable Abraham fully in charge. However I do fear for Morgan – the guy is devastated by the loss of his son and he gives the impression that he is going to buckle in this frightening situation. Top quality fun, and issue #60 ‘Surrounded’ is looking likely to be just as thrilling as Rick, Abraham & company try to escape the teeming hordes.